CARE IN SHEPPERTON- MORE ABOUT US: An introduction to further details about Care in Shepperton. What exactly is Care in Shepperton. 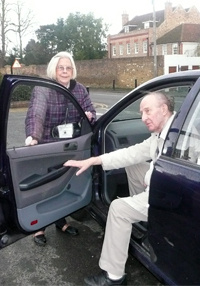 Care in Shepperton was founded in 1990 by local people who volunteered to use some of their own time to act as good neighbours in the Shepperton, Charlton Village, Littleton and Upper Halliford communities. Where there is a real need due to illness, age, infirmity or disability, Care provides transport for appointments at medical centres, hospitals, dentists, etc. Similarly, prescriptions are collected and a certain amount of shopping is done. If Care cannot help, we have a wide knowledge of local services and organisations with whom we can liaise to help overcome problems. When Can Care be Contacted.How Does Care Work.